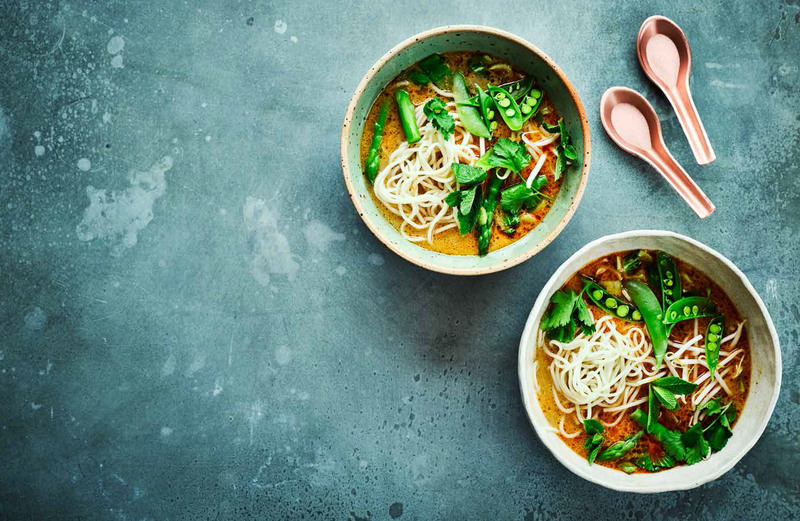 Whether you’re looking for a quick and easy weeknight meal, need a recipe that will impress guests, or are on the hunt for a delicious vegan dessert idea, there’s a good chance you’ll find it here as Lucy Watson shares her 3 favourite vegan recipes. We’ve teamed up with ex-Made In Chelsea star, PETA campaigner, and vegan restaurant owner Lucy Watson and delved into her top-rated cookbook, Feed Me Vegan. These are her top-three recipes. Short on time? Lucy recommends the Spicy Coconut Ramen as the perfect fast fix. Boil the ramen noodles in a pan of hot water for 2 to 4 minutes, or for however long the pack instructions state. Drain in a colander than blast with ice-cold water. Place to one side. Add the asparagus to a pan of boiling water and blanch them by leaving them in for 2 minutes. Drain in a colander before pouring cold water over them. Combine 4 tbsp of the chilli and lemongrass paste in a wok or saucepan with the groundnut oil. Cook on a medium heat for 4 to 5 minutes until it smells fragrant and has deepened in colour. Add the coconut milk, stock, and soy sauce to the wok and gradually bring to the boil. Thicken by cooking for 5 to 6 minutes. Cut the pak choi so the leaves and stems are separated. Add the stems, asparagus, and mangetouts to the pan and cook for two minutes. Stir in the sliced pak choi leaves and lime juice. Divide the noodles and beansprouts between two bowls, pour over the coconut broth and garnish with a few fresh herbs before serving. Got guests coming over? 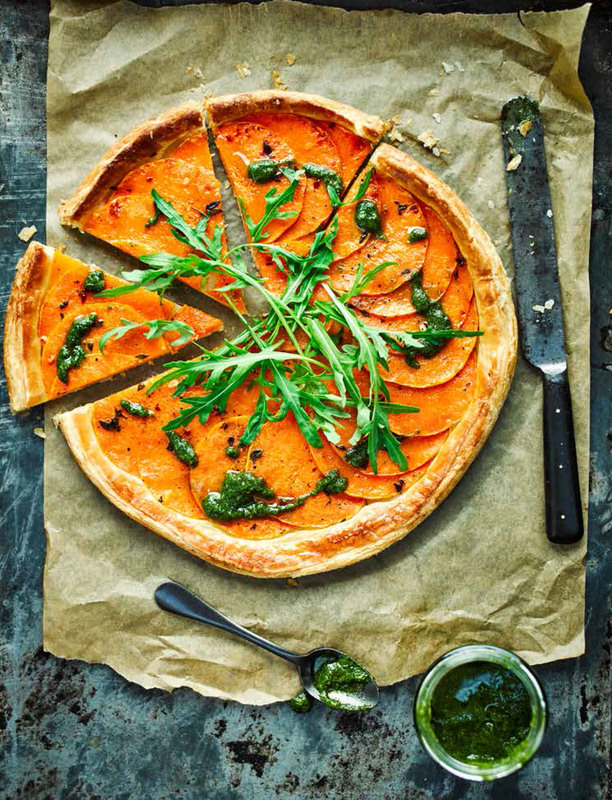 The Butternut Squash Tart with Pumpkin Seed Pesto is easy to throw together and the ultimate crowd-pleaser. Preheat the oven to 200C (180C fan, gas 6) and line a baking sheet with baking parchment. Add the sliced butternut squash to a bowl along with the thyme, chilli flakes, maple syrup, and oil. Season with salt and pepper, then toss together to coat. Roll out the pastry to 5mm thick on a lightly floured work surface. 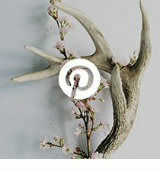 Using a dinner plate or something similar as a template, cut a 27cm circle from the pastry. Place it on the baking sheet and then score a circle around 1cm away from the edge using a tip of a sharp knife. Overlap the squash slices on top of the pastry, making sure to avoid the scored edge. Place a sheet of baking parchment on top of the tart and another baking sheet on top, then bake for 20 minutes. The remove the baking sheet and baking parchment and cook for a further 25 to 30 minutes until the pastry is golden and the edges are puffed. Make the pumpkin seed pesto while waiting for the tart to bake. Toast the pumpkin seeds and pine nuts in a dry frying pan for 1 to 2 minutes until the pumpkin seeds pop and are fragrant and lightly browned. Pulse the seeds and remaining pesto ingredients in a blender until smooth. You could also use a pestle and mortar, adding the oil at the end. Season with salt and pepper and then drizzle over the tart. Serve with some rocket leaves on top. 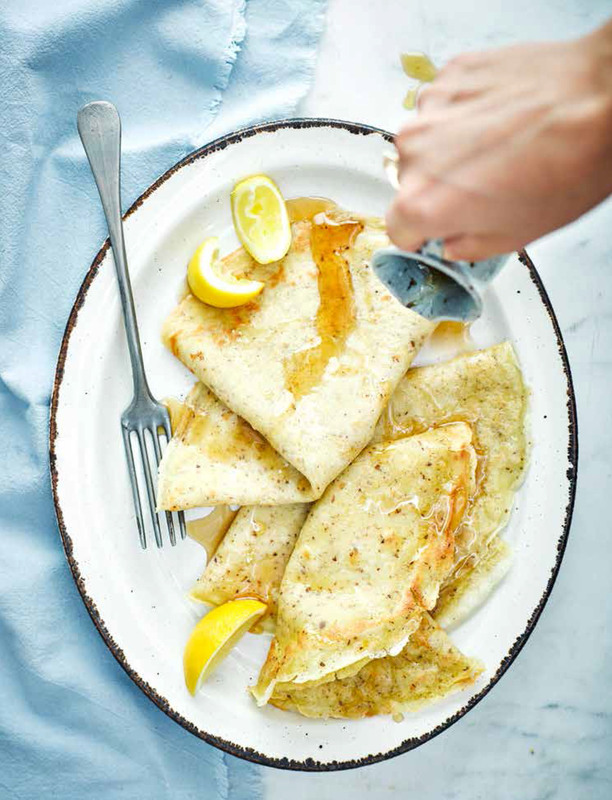 When it comes to mouth-watering desserts, Flaxseed Crepes are Lucy’s go-to favourite. Combine the flaxseed with 3 tbsp of hot water in a small bowl. Stir well, and then leave for 5 minutes until it forms a gel. Sift the flour and salt into a bowl and then add the milk, flaxseed mixture along with the margarine. Whisk until it forms a smooth batter. Leave it to rest for 30 minutes. Using a non-stick frying pan, heat a knob of margarine on a medium heat and then add a ladleful of the batter. Swirl the pan so that the base is coated with the batter. Cook the crepe until it is golden in appearance, and then turn it over using a spatula and cook the second side. Make sure to keep the crepes warm while you repeat with the remaining batter. Serve with a squeeze of lemon and a drizzle of maple syrup. You can keep the batter in the fridge for three days but you may need to add a splash of milk to loosen the mixture to prevent it from swelling. 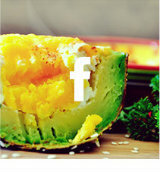 For more recipe ideas, practical kitchen tips, and food info, browse through the rest of the full Wren Kitchens blog.